In England, it can hardly be Easter without the obligatory Hot Cross-buns. We have a long tradition here in the UK of eating special small cakes during the spring festival. We owe this tradition it seems to the ancient Greeks. Our English word 'bun' is said to have come from the Greek boun, a circular or crescent shaped ceremonial cake, made of flour and honey which was offered to the gods. The pagans worshipped the goddess Eostre (from whom we get the name Easter) by serving small cakes decorated with a cross, similar to the Hot Cross buns we know today, at their annual spring festival. The English custom of eating spiced buns on Good Friday was thought to have been institutionalized during the Tudor period. In London at this time, a bylaw was introduced forbidding anyone to sell these buns except on Good Friday, Christmas, and at burials. This was possibly the first time we have a cross appearing on the bun symbolising Christ’s cross. Pour the milk into a thick bottomed saucepan and bring to the boil. Remove from heat then add the butter. Put to one side until it cools to hand temperature. Meanwhile, sift the flour into a large mixing bowl along with the salt, sugar and the yeast. After making a well in the centre of the flour mix, pour in the warm butter and milk mixture followed by an egg. With a wooden spoon start mixing together then use your hands to bring it to a sticky dough. On a clean and floured work surface, turn the dough out and knead. Hold the dough with one hand whilst stretching it away from you with the heal of the other, and fold back on itself. Continue this for about five minutes or until the dough becomes smooth and elastic in appearance. Place the dough inside an oiled bowl and cover with oiled cling film. Leave it to rise in a warm place for an hour or until the dough has doubled in size. Combine the sultanas, orange zest and toffee chunks along with the apple chopped into small pieces and sprinkled with cinnamon. Leave the dough in the bowl and begin adding the mix and kneading in succession to ensure an even distribution of the mix throughout the dough. Set aside for a further hour just as before not forgetting to cover with oiled cling film. On a floured work surface, divide and roll the dough into 15 equally sized balls. Choose either metal baking trays or ceramic dishes remembering in an outdoor oven the metal tray will conduct the heat more quickly, so adjust the cooking time. Line the bottom of your tray or dish with baking parchment and place the buns evenly with enough room to expand. Roughly cover with cling film or a tea towel and set to one side to prove for a final hour. If you are using a conventional oven, preheat to 220c or 200 C fan (or gas #7). 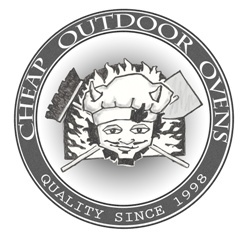 For outdoor oven cooking then do it at 180-200 C (gauging with your thermometer). For making the cross on the buns, mix flour with approximately 4 or 5 tbsp of water a bit at a time into a paste resembling runny toothpaste. Spoon it into a piping bag with a small nozzle or a homemade baking parchment bag (see here *). Then with a steady squeeze, pipe the white paste in a continual line one way and turn the tray and pipe the other direction to make the cross. Use an oiled knife to trim the cross to fall on each individual bun. Bake the buns for 20 mins in conventional oven or roughly 12 mins in outdoor oven depending on your fire and oven heat. Turn the tray or dish at least once for an even bake until they turn golden brown. For the glaze, heat the jam or marmalade in a saucepan until it turns runny and able to be brushed easily on to the buns using a pastry brush. Pull the paper out from the roll roughly 70cm or 28”. Fold the bottom edge of the paper across to the side to make a triangle. Cut along the edge with scissors to separate the paper from the roll. Ensuring the fold is crisp, use a sharp knife to cut along the fold line to make two triangles. Take one of the triangles with the longest side pointing away from you. Roll one corner in on itself to the apex pointed toward you and hold in place. With the other hand bring the opposite corner around to form a cone shape. Make sure you pull the cone tight enough to have a sealed pointed end. Staple or fold the points over tightly onto themselves to keep the cone from unravelling. Hold the cone or stand the cone in a glass for support and spoon the paste into the cone. Bring the wide edges at the top of cone together and roll down, pushing the paste towards the piping end like a dwindling supply of toothpaste in a tube. Then when you're ready to pipe the cross, snip a small hole in the tip and pipe away. A cross for England or a cross for Christ, toasted with butter and dusted with spice! Hot cross buns - enjoy them, they're nice!